This advanced training block is designed to assist an athlete in both force production and movement efficiency. An athlete that has a foundational level of strength must begin to utilize it in the three muscle actions present in every dynamic movement. These three muscle actions include the eccentric, isometric, and concentric, with each being trained as individual blocks to improve their strength and an athlete’s overall reactiveness. Eccentric: The first movement phase trained specifically is the eccentric muscle action phase. The eccentric phase of movement is vital for deceleration of the body. This leads to a reduction in injury likelihood and performance enhancement through tissue remodeling, or strengthening. Isometric: Although the isometric phase is only realized briefly in a movement such as running, it plays a major role in the transfer of energy absorbed in the muscles and tendons during the eccentric movement phase. By training the eccentric phase to absorb higher amounts of force the isometric phase must be trained in order to convert this stored energy into power. As the isometric phase becomes trained, the amount of free-energy that can be transferred from the eccentric to the isometric and finally through the concentric muscle action is improved. Reactive Block: The concentric (shortening) muscle action phase, is the acceleration of the body in the forward direction while running. If the previous two muscle action phases have been trained appropriately, the amount of energy transferred through the contraction will be transferred through the entire movement. Through the individual training of each of these phases of movement any muscular contraction, or movement, can be improved to the greatest extent. The training of these three phases will increase the strength levels of athletes, allowing them to apply greater force than previously possible. This increased force production leads to faster sprinting speeds and more success on the field. In the “V” graphic shown above, the left line is eccentric, or absorbing force, and the right line is the concentric, or force producing capabilities of an athlete. The isometric phase occurs briefly between the eccentric and concentric phases. Based on our understanding of the SSC and the force producing capabilities of the muscles, the concentric portion (right side) of this “V” will never be steeper than the eccentric portion (left side). 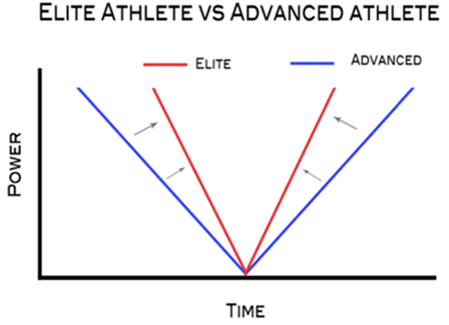 It is this reason that each of the three phases must be trained individually and maximally, in order to allow maximal power and maximal efficiency for every athlete. Athletes at every training age can benefit from this training, with individualization based on every need being possible. Every program is hyperlinked and includes instructions to guarantee simple and efficient completion. By training the ability to absorb, re-direct, and produce high-levels of force an athlete will move more efficiently and reduce their likelihood of injury, all while improving their performance in sport.